Rutabaga is a root vegetable that originated as a cross between a cabbage and a turnip. After making mashed rutabaga, I still had one rutabaga remaining, so I decided to try something different. 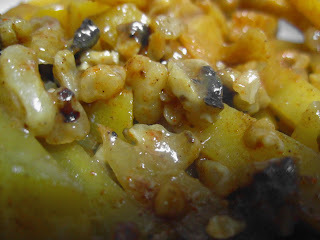 This sweet side dish is quick and easy to make, just cook some rutabaga, add nuts, seasonings, and maple syrup, and you’re just about good to go. The sweetness of the maple syrup accentuates the natural sweetness of the rutabaga, while the nuts (I used walnuts, although pecans would be another good option.) add to the texture, and the spices bring an additional warmth to make for a more interesting side. What are your favorite ways to prepare or eat rutabaga? ½ cup nuts, chopped I used walnuts, but pecans would be another good option. Put rutabaga and water into a pot and cook/steam until water is halfway evaporated. Add maple syrup and spices and mix well, making sure that the mixture coats the rutabaga completely. Toss in walnuts, mix a bit, and serve.